© 2014 Barling & Wakering Villages Plus Website. All rights reserved. Site designed & maintained by Richard Kirton. 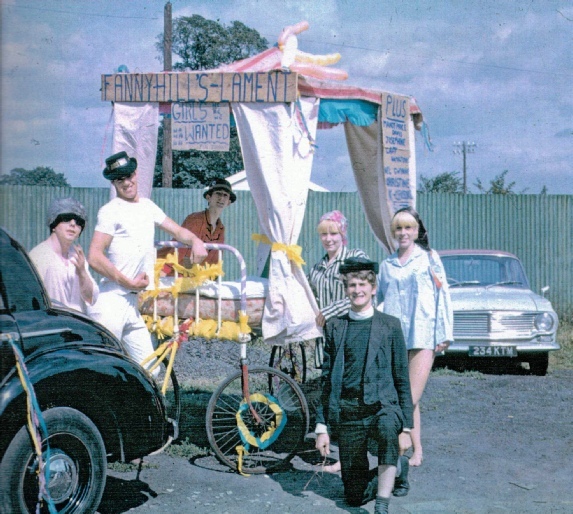 I was sorting through some of my old photographs and came across this photograph which reminded me of our local carnival held in 1965. Unfortunately our float which was designed to be a four poster bed mounted on bicycle wheels and towed by my car did not make it to the start of the carnival in Barling. Our float started out from the British Legion Club car park (Just as well Laurie was not on point duty that day as I could have picked up a ticket for towing an unsafe load.) and headed for Barling where the floats were to be judged prior to the start of the procession. All was going well until we turned into Little Wakering Road when the bicycle wheels decided to part company from the metal bed frame. It was at this point we decided to abandon the float and a kind resident agreed that we could park the float in the driveway of her house, providing we promised to remove it before her husband returned home that evening, which we did. Left to right in the photograph is John Glen, Barry Burles, Vic Lee, Maureen Osbourne, Leslie Upton and Dave Lee in the foreground. Hopefully this e-mail will trigger other memories of past local carnival events which regularly took place for over twenty years or more. Robin Trower – Local Lad made Good?